We have an agreement with Dongfang Electric (Yixing) MAGI Solar Power Technology Co., Ltd. for import and sales in Japan of the photovoltaic (PV) modules and cells which are made by this company. We sell the PV modules to the customers in Japan, in cooperation with the major photovoltaic system integrators, for megawatt class generation plant, generation plant of medium and small sizes field installation and rooftop installation on factories and houses. We sell the cells to the manufacturers producing custom-made modules in Japan. Our scope of work covers the design of optimum layout of modules compatible with the particular land and rooftop conditions, selection of auxiliary electric equipment, installation works and process of grid connection. Dongfang Electric(Yixing) MAGI Solar Power Technology Co., Ltd.
DEC Magi Solar Power Technology Co., Ltd. is a joint-venture between Dongfang Electric Corporation (DEC)* and a German company. This specialized manufacturer was established for the manufacturing, engineering development, and sales of solar power generation panels using German technology. * Dongfang Electric Corporation (DEC) is a Chinese state owned company and a largest Chinese general heavy electric equipment manufacturers which produces thermal and hydraulic power generator, power transmission and transformation equipment, rolling stock and renewable energy-related equipment. The company has agreements of technical cooperation with Japanese electrical and heavy equipment manufacturers. The company has subsidiary manufacturers of equipment of renewable energy such as wind turbine and solar module. PV cell and PV module of DEC MAGI Solar are made under the technical license from Germany. The manufacturing equipment are imported from Germany such as world known Centrotherm Photovoltaic AG and the other European companies. MAGI's cells and modules are produced with the most advanced production facilities and process. The production facilities are all automated and numerical controlled. The conversion efficiency of mono-crystal cell is 20.2% at the laboratory level and the average efficiency for the production is 18.6~19.0%. MAGI Solar developed PID free cell and module by a technical cooperation with a German laboratory. They were tested by a well-known testing body and certified as the cell and module which prevent or minimize PID effect. The output of module is decreased in a long term service due to high temperature, high humidity and high voltage. 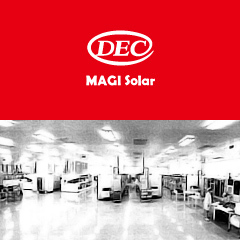 DEC Magi Solar Power Technology Co., Ltd. handles start to finish production from the introduction of silicon material to panel manufacturing through vertical specialization in the DEC group, thereby enabling an advanced level of quality to be maintained and controlled. * The Japanese JET certification is currently under examination and is expected in the near future. Warranty period for defect in materials and manufacturing 10 years. Warranty period when the rated power drops under 90% 10 years. Warranty period when the rated power drops under 80% 25 years. DEC Magi Solar Power Technology Co., Ltd. handles various types of polycrystals. Please inquire for additional details. Copyright © MIZUSHO CORPORATION All Rights Reserved.